This all natural intense treatment masque with biotin & bamboo extract is for thin, fine hair. It penetrates to moisturize and repair over-processed, dry, brittle or damaged hair. It thickens, volumizes & softens. I love it. This is the best Deep Conditioner that I have ever used. It smells so good that you want to rub it all over your skin. I consider this a light protein treatment. As you see, I highlighted "Vegetable Protein", which is in 10th place on the list of ingredients.This indicates that the amount of protein in this product is really small, so it is safe to use it weekly. When I apply this, it makes my hair feel immediately strong (I kid you not), and my hair elasticity is amazing when I rinse this product out. It is very moisturizing as well. In my opinion, it is a combo of protein and moisture, so I do not follow up with a moisturizing treatment. Although, after rinsing this out, I use a non-protein Leave-in conditioner, to balance out the protein in the Deep conditioner. I always apply this to sectioned wet hair right after cleansing. A little goes a long way. I usually let it sit on my hair for 30 minutes, covered with a plastic cap. I really believe that it will curb breakage if used consistently. I tried this the other day after doing a Bentonite Clay Cleansing. The result was amazing! As we know, Bentonite Clay clarifies the hair, allowing treatment to really penetrate the hair. That was an experience that I look forward to occurring again. My hair was soft, strong, felt thick and it was so shiny. Anyway, you may have already guessed that this is a must-have for me. What about you? Have you tried Organic Yucca and Baobab Anti-Breakage Masque? Please share your experience below if you have. I have heard nothing but great reviews about this product. This once again, just proves that everyone's hair reacts to products differently. I love Shea Moisture Products. I have never tried this particular product because I am so stuck on Shea Moisture Raw Shea Butter Shampoo & Conditioner. I will have to try it one day. Loved your review. Shared it on Twitter. Thank you for the shout-out sis. I love that shampoo too but not too crazy about the Restorative conditioner. It is great as a moisturizer though. I've heard so many great reviews about this recently. In the beginning people didn't seem to like it. It's the only SM product (well except the new ones) that I have not tried. Great review sis, glad it's working for you. I have not seen them. I have to try those. I love most SM products. I've just started using this product; and I am LOVING it. I'm a 24 y/o white female with naturally straight, extremely thin hair. I've had some medical issues in the past that caused hair loss, and ever since I've battled very brittle hair, especially in the summer heat, that would fall out in droves due to the breakage. For the past four years I did not know what the cause of my hair loss was, but I think I've found the answer! 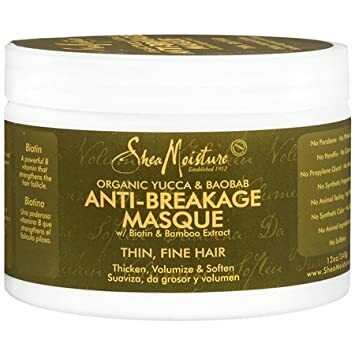 I've used the Anti-Breakage Masque TWICE and have already noticed less breakage aka less hair fall. I'm sure you can understand how great it feels to run my fingers through my hair in and out of the shower and not pull out handfuls of hair!